There will be no women at the helm of China’s Communist Party when the leadership is reshuffled next month, but there are many more opportunities for women in today’s China than there were 100 years ago. Then the only way to achieve influence was to marry it – and three sisters from one family showed how. On one bank of the Huangpu river in Shanghai stands a forest of steel and glass skyscrapers, but on the other – colonial splendour. A century ago, foreigners unpacked a whole new fascinating way of life on the docks here. From Western ships came bicycles, engine parts and young Chinese with a vision of modernity – adventurers like Charlie Soong who had been out to see the world and had come back with ideas about revolution and the role of women. A Bible publisher and pillar of Shanghai society, Charlie had sons, and in any earlier generation he’d have ignored his daughters. But he had been educated by American Methodists and he believed in Christian virtue, democracy and the dignity of women. From this waterfront, he sent his daughters to America to get a grounding in all three. “It was the hope of the father that these women would come back from the West with the knowledge that they can change China, and change the fate of the people, of the women, and eventually of themselves,” says Mabel Cheung, director of a film about the Soong sisters. As Shanghai boomed, their horizons expanded. And in 1914 the eldest, Ailing, made a strategic match with a young man, H H Kung, who traced his ancestry back to Confucius. One scene in Mabel Cheung’s film shows Shanghai’s finest in Western dress, listening to Western music, while the groom tells wedding guests there will be no Chinese-style squat toilets in the marital home, only the best sit-down contraptions imported from America. Money was no object. He and his bride would become China’s richest couple. Once Kung became finance minister, Ailing discovered a useful way of making her investments grow, explains Jonathan Fenby, who has written a history of modern China. “He would sit at home and conduct various negotiations about revaluing the currency, or doing this that or other. And she would be taking notes, and get on the phone to her broker afterwards and place large investments,” he says. Qingling, the second sister, married a very different kind of politician – Sun Yatsen, the revolutionary leader of China, who had become President of China after the overthrow of the Qing dynasty in 1912. As Sun was an older man and already married, Qingling’s parents objected – so she jumped out of a window and eloped with him. Like many other young Chinese people at the time she believed passionately in the idea of a new China, a country freed from feudalism, poverty and imperial dynasties. A country with an equal role for women. Qingling became Sun Yatsen’s constant companion as he struggled to make peace between republicans and warlords. The youngest sister, Meiling, did not immediately marry. 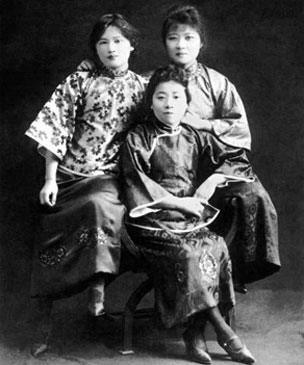 But all three sisters were very much in the public eye, and in the news magazines almost as often as film stars, says Verity Wilson, who has written several books on Chinese clothing and culture. “They were constantly on show in a way that the imperial family in days gone by, had never been,” she says. But life wasn’t just a round of photo opportunities and jazz. Qingling’s husband Sun Yatsen died in 1925 and his movement split into warring camps. His successor, Chiang Kaishek, was a no-nonsense military man, some would say a fascist. Qingling was horrified by his tactics. And doubly horrified when she discovered her younger sister Meiling was planning to marry him. In Mabel Cheung’s film, she complains to her elder sister Ailing that Chiang Kaishek is just trying to use the Soong family name to boost his career. But ideology drove a wedge between the sisters. In 1927, Meiling married Chiang Kaishek, who soon afterwards launched a bloody purge of communists in Shanghai. Qingling left for the Soviet Union, and the following year Meiling became the first lady of China. “Qingling was making a lot of demonstrations and making a lot of noises, which really irritated Chiang Kaishek,” says Mabel Cheung. In 1937, when Japan launched a full-scale invasion of China, Chiang’s nationalists and the communists were briefly reunited against the common enemy. The sisters ran field hospitals and literacy projects together. Meiling was something of an ambassador for her country, becoming the first private citizen of any country to address the House of Representatives in Washington. But her command of English and familiarity with America were not her only weapons. “Many foreign journalists visiting her found her the kind of embodiment of the mysterious, beautiful Chinese woman,” says Fenby. As soon as the Japanese had surrendered in 1945, the nationalists and communists turned on each other again – and this time it was a fight to the finish. Meiling fled with the nationalists to Taiwan and for the next two decades did her bit to ensure that the US sided firmly with the island against the mainland. Ailing went to America and Qingling stood by the revolution, showered with honours for the rest of her life by a grateful communist state. In the Soongs’ day women could only exert influence through their husbands. Now China has women running multinationals and going into space but top-tier politics remains off-limits. There are no women on the standing committee of the Communist Party politburo. This may be partly because, in tales from Chinese history, women are often depicted as a danger, a threat, says Xun Zhou, a historian at Hong Kong university, who detects a tendency to blame wives for the bad luck or bad judgment of their husbands. Take Mao and his wife Jiang Qing. It’s often said that Mao’s only mistake was to listen to Jiang Qing in old age. And then there is the case of Gu Kailai, wife of the disgraced Chongqing party boss, Bo Xilai, points out John Fenby. Traditionally these scenarios involve dynastic rivalries at court between different concubines and their offspring. Neither Qingling or Meiling had children so could never be accused of playing that game. Meiling nonetheless became a convenient hate figure for China’s leftists. Until the reform era in the 1980s, all good communists were taught that she was a wicked bourgeois. “As I was growing up, she was seen as a bad character,” says Xun Zhou. Chairman Mao died in 1976 and the idea of socialism with Chinese characteristics was dreamed up to bridge the divide between capitalism and communism. Make-up and necklaces didn’t seem so wicked after all, and Meiling was rehabilitated. In a cemetery in Shanghai there are tall cedars and flowers in gold and red, the colours of the Chinese flag. Qingling is buried here and there’s a dazzling white statue of her. Her sisters are buried in America. Ailing died in 1973 and Meiling led a quiet life in a Manhattan apartment dying at the grand old age of 105, in 2003. After 1949, the three sisters were never together again, estranged by history. But all three have taken their thoughts on that separation to the grave. I knew nothing of the Soong sisters. But I had heard of Madame Chiang Kai-shek. Madame Chiang was a second tier dragon lady, less colorful than Turandot or Cixi, and less scary than Madame Mao. In the kind of books I read, Madame Chiang intrudes in men’s stories, with her luggage and her demands. War books are notably impatient with women as a rule, but to read some of them, you would believe that Madame Chiang was the curse of the China Burma India theater. And of course Madame Chiang laughed last, outliving all her contemporaries before dying at the age of 105. While I was in Beijing, I walked by a beautiful walled compound, the “Former Residence of Soong Qing-ling,” open to the public. The compound had been the birthplace of Emperor Pu Yi, but it is now occupied by an exhaustive museum covering the life and the achievements of one Soong Qing-ling, a name that meant nothing to me. Soong Qing-ling was the wife of Dr. Sun Yat-sen. (There was a name I recognized, the father of modern China, the founder of the Kuomintang party, and the first President of the Republic of China.) She was a tireless supporter of children and the downtrodden. On her deathbed, she was made Honorary Chairman of (red) China. She was also the sister of (rabidly anti-red) Madame Chiang Kai-shek. Now that is heavy. How could two sisters have ended up at such political antipodes? As soon as I came home I set out to find out more about the Soong sisters. The sisters’ father was Han Chiao-shun (1864-1918) an ethnic Hakka Chinese from Hainan. Han worked at one point at his uncle teahouse in Boston before becoming a sea hand on a Coast Guard ship in 1879. On the ship, he received Christian teachings from the captain, and thereafter, Han became a Methodist Christian. He also changed his name to Charlie Soong. Charlie Soong was ambitious and bright. He completed his education at Trinity College (today Duke University) and returned to China in 1886 as a Methodist missionary! There, he married a young Chinese Episcopalian girl, Ni Kwei-tseng. Charlie became very wealthy printing and selling Chinese bibles. He and his wife had three sons, and three daughters with destinies: Soong Ai-ling (Nancy) was born in 1890; Soong Qing-ling (Rosamond) was born in 1892; Soong Mei-ling was born in 1897. China at the beginning of the twentieth century was convulsed with xenophobia, including anti-Christian paranoia. Charlie and his wife feared for their children’s safety. Having received an American education that had served him well, Charlie sent his daughters one after the other to Wesleyan College, in Macon, Georgia. There, the gifted and exotic sisters made quite a splash. Back in Shanghai, Charlie was closely associated with revolutionary personalities, including the charismatic Sun Yat-sen (1866-1925). When first daughter Ai-ling came back from college, she became Sun Yat-sen’s assistant. Although she wouldn’t attain the level of publicity reached by her sisters, Ai-ling did have an eventful life. She married H. H. Kung, at one point the richest man in China, and both were involved in much political string-pulling. After she married, Ai-ling was too busy to work. But by that time, her sister Qing-ling had graduated too and she in turn took over as SunYat-sen’s secretary. Sun Yat-sen already had a wife, Lu Muzhen, whom he kept far in the background, partly because the poor woman had old-fashioned bound feet. Nevertheless, in 1915, Qing Ling and Sun Yat-sen fell in love and married, to the consternation of Charlie Soong. Charlie thought his friend was much too old and his daughter much too young, but their love was in fact strong and based on noble and generous goals. When Mei-ling returned from Georgia, she also found a husband, wily General Chiang Kai-shek (1887-1975). The general courted the young girl assiduously, and Madame Soong finally consented to let him marry Mei-ling if he divorced his first wife and became a Christian. Sun Yat-sen was a unifying figure during the early days of the Chinese republic. Alas he died in 1925 and the country lacked a convincing leader. Soon, China was divided between two movements: the communists and the progressively anti-communist Kuomintang (Nationalist Party), led by Mei-ling’s husband, Generalissimo Chiang Kai-shek. Although not a communist, Qing-ling left China for Moscow temporarily when the Kuomintang expelled communists from its ranks in 1927. The constant struggle for control between the communists and the nationalists during the 1930’s weakened China and left the country vulnerable to Japan’s expansionist ambitions. Chiang Kai-shek was more focused on the enemy within (the communists) than on the enemy without (the Japanese). Nevertheless, thanks in part to the efforts of Qing-ling and Mei-ling, there was an effort at communist and nationalist cooperation – the United Front – against the Japanese. While Qing-ling did her bit for the war effort at home, Mei-ling went on a ground breaking tour of the United States to ask for help (just like Winston Churchill, she must have slept soundly on the night following the attack on Pearl Harbor). As Madame Chiang Kai-shek, Mei-ling was all over the place, charming most but rubbing a few, such as Pearl S. Buck and Eleanor Roosevelt, the wrong way. During the later phases of the war, the Generalissimo and his wife were the public face of China in the U.S., earning the “Man and Wife of the Year” issue of Time magazine. 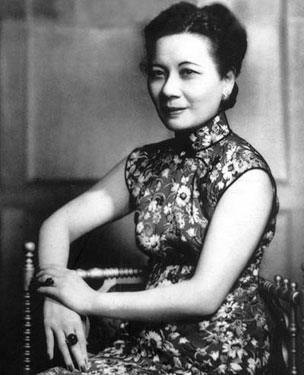 Mei-ling was also the first Chinese national to address the U.S. Congress. In reality, Chiang Kai-shek was a mediocre general, obsessed with his fight against the communists, and an infuriatingly unreliable ally to the British and American generals in Burma. After the war, as we all know, the long running Chinese civil war accelerated and the communists took control of the Mainland. The Kuomintang faithful retreated to Taiwan, where Chiang Kai-shek ruled under martial law for decades. Where did that leave the sisters? Ai-ling, the wealthiest, left for the United States in the 1940s. There, she lived privately and died in New York in 1973. Mei ling was first lady of Taiwan, seeking and garnering less publicity than one might have expected. Mei-ling left Taiwan after the death of Chiang Kai-shek in 1975 (Chiang was succeeded by a son from his first marriage who had a poor relationship with his stepmother). Mei-ling then also moved to New York where she was unaccountably quiet and obscure, albeit luxuriously so. When she died in 2003, many were shocked to learn that she had been alive all that time. The one who never left, Qing-ling, pursued worthier goals. She became a saint of sorts, the “Mother of China.” She worked for children and for women. She represented her country in communist and third world nations. She wrote. She received the 1951 Stalin Peace Prize (hmmmm). In 1981, two weeks before her death, she was admitted into the Chinese Communist Party, so that she could be made Honorary President of the People’s Republic of China. What a great story. Like a dream collage of Kennedy brothers and Gabor sisters painted in shades of red. If you want to put the prettiest faces on the characters, there is a Hong Kong movie, The Soong Sisters, with Maggie Cheung as Qing-ling, Michelle Yeoh as Ai-ling and Vivian Wu as Mei-ling. The movie is a series of gorgeously photographed scenes that don’t quite add up to a coherent whole. Some parts, like Qing-ling’s Moscow venture feel as primitive as a silent movie. With its memorable music score, the film is reminiscent of another coloring-book epic, David Lean’s Doctor Zhivago. But if you are interested in the sisters (and knowing their story, who wouldn’t be?) the movie is a good way to learn the basic lines of their destinies. After writing this page I read a long and, at times, almost jaundiced biography of Mei-ling, The Last Empress, by Hannah Pakula. It is a flawlessly researched biography, with valuable insight into the secretive Ai-ling, and the less known, yet just as bright and manipulative Soong brothers. Mei-ling herself comes across as more of a caricature, especially during her much publicized trips to the United States, which were never far from degenerating into PR disasters. Chiang Kai-shek is described most of the times as a stooge – which may be a bit much. You should only read this book if you are willing to change your romantic views of the sisters and their hangers on. Ai-ling and the Kung branch, notably, could be described as war profiteers. Most poignant is finding out that neither of her sisters attended Ai-ling’s funeral services, because by then, they were just terrified at the idea of meeting each other.